We believe life is an incredible journey. It may be filled with a husband or wife, one kid or many. Along the way friendships are forged and figured out, life is filled with turns and seasons...some good and some not so good. And there is an aching in the soul to know the creator and be known by him. At BeRefreshed...we'd like you to consider us a refreshing source of uncommon common sense to help keep your journey balanced, and free. Praying Like Jesus Taught Us! 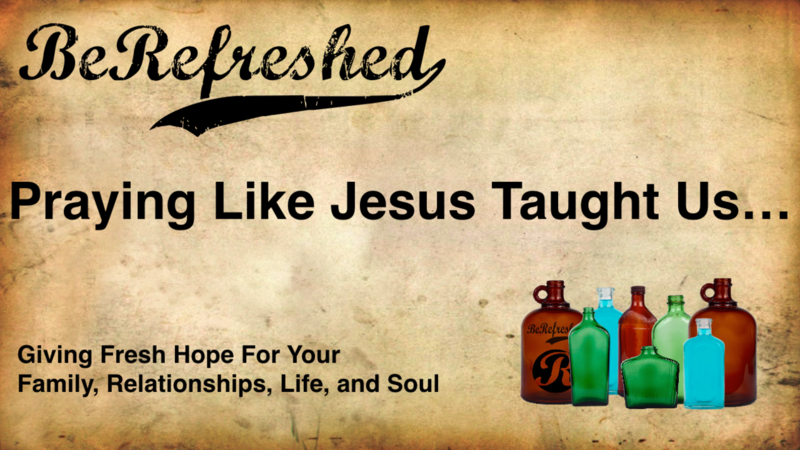 Here at BeRefreshed--We have a passion to help you succeed at family, relationships, life and soul! We like to say we bring Sagacity--a little "uncommon, Common Sense" to the key areas of your life! Family can be the cornerstone of a great life. We offer you some practical advice on creating a great marriage, and we give you simple solutions to "Raising Kids who turn out right"! If we're not careful relationships can bring a great amount of stress into out lives. Here you will finds some fresh insights into avoiding the stress and finding and nurturing a healthy tribe. Lets face it...Life can get overwhelming at times. It can get out of balance, and at times unravel...but if we keep a little perspective out live's can be an incredible journey. Let us help you enjoy the journey! Without a healthy soul we are simply wanderers...lost in a sea of chaos. True "sagacity" and real life" comes from a relationship with the creator of our souls. We have a passion to introduce you to the "Lover of your Soul"! Make sure you're signed up to get our email updates and specials!